Croatan Beach is a Virginia Beach neighborhood located just south of Rudee Inlet. In addition to the oceanfront beach, Croatan has two large lakes - Lake Christine and Lake Wesley. Camp Pendelton, a Virginia National Guard training facility, lies to the south. 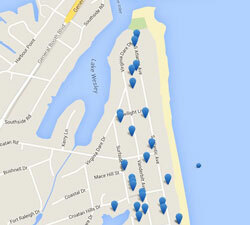 See a map of Croatan Beach's location. With two designated surfing areas, Croatan is popular with local surfers. If you want to do some surfing during your vacation, this is a area of Virginia Beach to be in. Croatan surfing regulations. There is a city-operated parking lot located at the south end of Vanderbilt Avenue adjacent to Camp Pendleton that is used by Virginia Beach residents visiting the beach for the day. Parking hours and fees. Croatan is a residential neighborhood. There are vacation homes available for rent here, but there are also many residents who make this their permanment home. This makes Croatan a quieter spot for a vacation than the resort strip. You'll need to get in your car and drive if you want to go out to eat, but there are several nice restaurants to choose from at nearby Rudee Inlet. At this end of the beach, you're also closer to the Virginia Marine Science Museum and Ocean Breeze Water Park. Oceanfront at Croatan Beach. 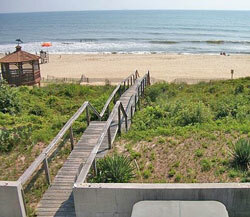 Five bedroom, five and a half bath oceanfront home. Enjoy great views from the oceanfront deck. This home has direct beach access via an elevated walkway. There's a grill on the deck for outdoor dining - or prepare your meals in the fully equipped kitchen. Five Bedrooms and Ocean Views. This 5 bedroom, 4 bath home has unobstructed views of the ocean. Great for large groups. Sleeps 14, has large open living/dining/kitchen area, and table space for 14. 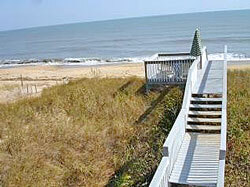 Luxury Oceanfront Croatan Beach Home. Large oceanfront home with seven bedrooms and six baths. 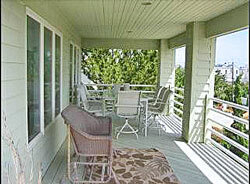 Located right on the dunes with a private walkway to the beach. Luxury accomodations with four master suites, two kitchens, elevator, rec room with pool table and ping pong, hot tub, and baby grand piano. Large Croatan Beach Home with Semi-Ocean Views . Seven bedrooms and five baths. Just across the street from the beach. Has a rec room with pool table, swimming pool and hot tub. Croatan home on Lake Christine and Two Blocks to Oceanfront! This large five bedroom, 3.5 bath home has a great location, close to the oceanfront and on Lake Christine. Back deck has beautiful water views. 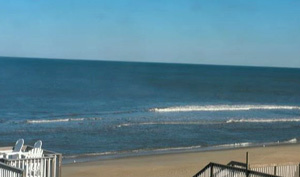 More Croatan Beach Vacation Rental Listings - At HomeAway. See More Virginia Beach Vacation Rentals - At Flipkey by Tripadvisor. And, if you want to check out hotel options - Virginia Beach hotels.